Take the general gameplay of the 2013 PlayStation 3 and PS Vita game Dragon’s Crown, then slap on the graphic style of the 2002 online game Adventure Quest, and you’ve got something comparable to Dungeon Punks. Set to come out on PS4, Xbox One, and PC sometime this summer, Dungeon Punks is a multiplayer, arcade-style brawler being developed by Hyper Awesome Entertainment. PAX East 2016 was the first time the developer showcased the game to the public, and I got to spend some time brawling my way through a few its stages. The gameplay is what you might expect from an arcade-style brawler — move from one 2D area to another, while clobbering enemies that wander into the area from all sides. Each of the six playable heroes have unique attacks and powerful spells, and all six can be in your party at any time (three on the field, and three that can be swapped out). Up to three people can play locally at a time, but if you’d rather play alone, the AI is capable of taking over any unused party member. Similar to Dragon’s Crown, players are able to find and equip different weapons and items, as well upgrade their skills and attacks. While I wasn’t able to play Dungeon Punks for very long, I could see that these RPG mechanics have the ability to keep gameplay fresh, especially since players will likely have to repeat a few stages now and then. I know I had to repeat a stage, after one challenging boss bested me and the other person I was playing with. However, although I love challenging games, I was annoyed at losing to this boss. The problem was, I didn’t know I was losing until I was already dead. While the boss’s health bar was fairly visible, my own was just a tiny line above my character’s head, and it was difficult to keep track of in the chaos. Additionally, my character never really reacted to being hit, at least not in a way that made me fully aware of what was happening.But, with still several months left before Dungeon Punks releases, there is plenty of time for these things to be fixed. 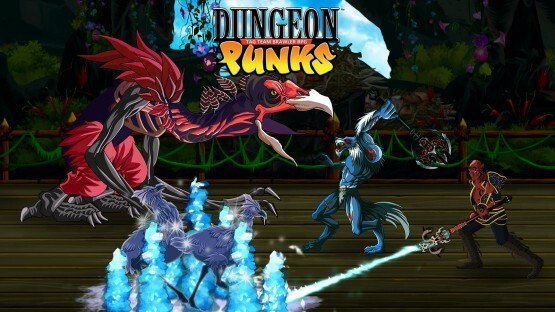 Overall, I liked my time with Dungeon Punks, like I enjoyed playing Dragon’s Crown and nearly every other arcade-style brawler I’ve gotten my hands on, and I’m looking forward to see what changes are made to it in the coming months.